As much as an icon as Humphrey Bogart has been and for as long as he's held that status, it's hard to believe that he already was 40 years old before he became a true movie star and that his career as a legend lasted a mere 15 years. The film that gave him his first starring role and launched him into the celebrity stratosphere, High Sierra, was released 70 years ago today. Bogart had been kicking around the Warner Bros. studio system in supporting gangster roles since he made his big impression repeating his Broadway role as Duke Mantee in the 1936 film version of The Petrified Forest. 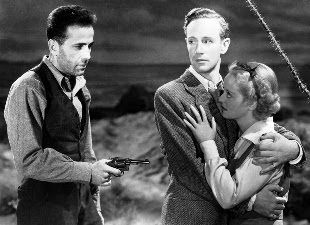 Bogart would never have received that break if the star of the play and the movie, Leslie Howard, hadn't insisted that Bogart must repeat the part on film. 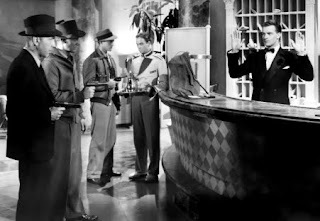 Warners had gained a reputation as "Murderers Row" with its success in the gangster genre and its stable of famous crime movie stars such as James Cagney, Edward G. Robinson, George Raft and Paul Muni. 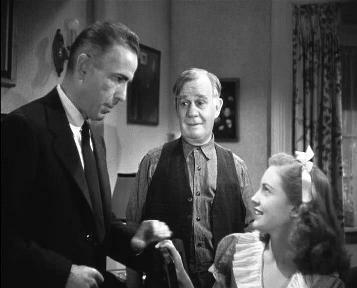 The studio didn't see the need for bringing out a New York actor for the part, but Howard and Bogie won out. 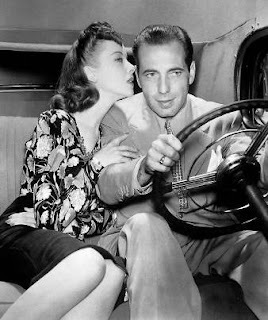 Bogart got a contract with the studio out of the deal, but his career seemed stuck in neutral. W.R. Burnett, who wrote the novel Little Caesar, whose film version just happened to premiere 80 years ago today, penned the novel High Sierra and Warners snapped up the rights two weeks after publication, envisioning it as a vehicle for Muni. They gave the book to one of their young writers, John Huston, to turn into a screenplay and he produced a script that followed the book fairly faithfully, but Muni rejected it. The studio brought Burnett in to work with Huston on another draft, but Muni nixed that one too. In the meantime, Bogart had seen the High Sierra script and knew he had to play Roy Earle, seeing in him a part that could lift him to the next level of Hollywood actors. 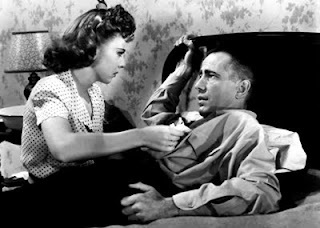 The studio pursued Raft, who happened to ask Bogart his opinion of the script. Bogart acted less than enthusiastic, telling Raft that it just seemed like another standard tough guy role who gets shot up in the end. He successfully talked Raft out of it and the studio turned to him, even though Earle is substantially older than Bogie was. They began makeup tests and when those passed muster, the part was his. 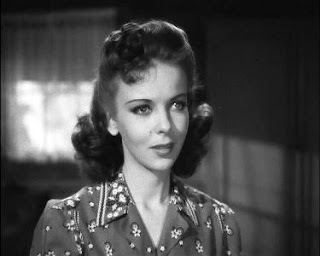 Raoul Walsh was assigned to direct and Ida Lupino was cast as the girl of one of the criminals. Bogart, Lupino and Walsh had all worked together in They Drive By Night. 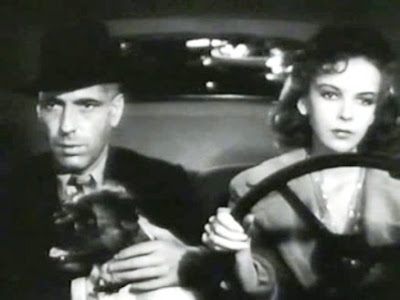 Since Bogart still wasn't a bankable name and They Drive By Night was considered a big hit for Lupino, she got top billing. 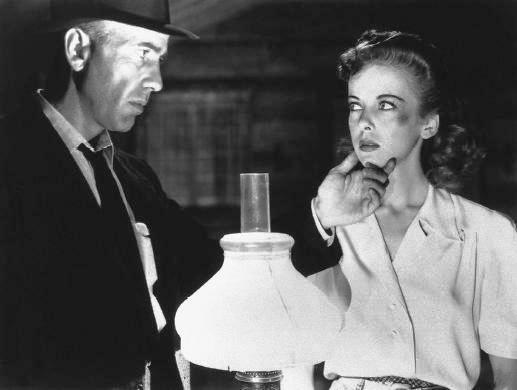 High Sierra was the last film Bogart made where his name didn't appear first. 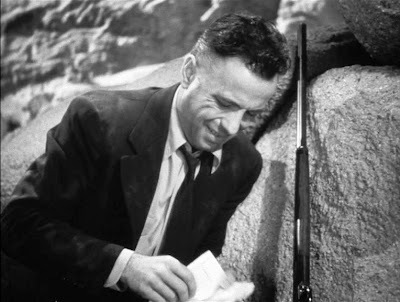 High Sierra also launched the friendship that led to one of the all-time great actor-director partnerships between Huston and Bogart, which would premiere later that year with Huston's directing debut, The Maltese Falcon. Walsh opens his film with the credits scrolling up with the Sierra mountain range in the background, foreshadowing its role in the film's climax, before he fades into a shot of the Governor's Mansion. We move inside where we see a man, presumably the governor, as he signs what we see in closeup is an unconditional pardon for Roy Earle. We then see a montage of shots from a prison: Inmates going about their day, the cells, the guards, etc., until we see its name: Mossmoor Prison and sidle down to the prison gates where a man waits in a car. 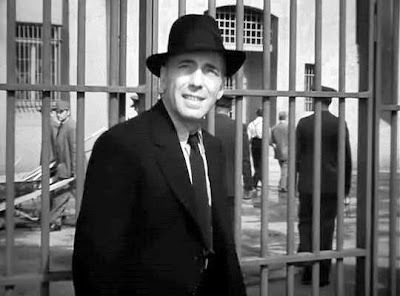 Then Roy Earle (Bogart), looking sharp in a suit, tie and hat shakes a guard's hand, the gates open and he steps out to freedom. 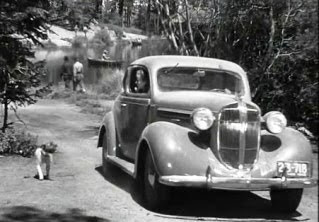 The driver (George Lloyd) gets out and tells Roy he's been waiting more than an hour for him. "I've been waiting too — over eight years," Earle replies. The man who picked up Roy notices his distracted air and asks him if he's OK. "I will be, just as soon as I'm sure that grass is still green and trees are still growing," Roy tells him before heading for a walk in the park where he bypasses a newspaper announcing his release from prison (He's identified as a "Famous Indiana Bank Robber" and people are upset by his early release) to enjoy nature and even toss a baseball back to some kids. That's what separates Roy Earle from the usual gangster you'd find in that movie genre. Sure, he's a tough guy, but he also has a tender, empathetic side as we will see later, a side that will hurt him in a way no bullet ever could. Following his brief sojourn with nature, Roy heads to a house where he expects to find Big Mac. (No, not the sandwich, the crime boss who backs his heists and arranged his pardon.) A man and a woman are waiting for him: the man reading the newspaper and wondering what's keeping him, the blonde (Isabel Jewell) filled with excitement at the prospect of meeting the infamous Roy "Mad Dog" Earle. The man (Barton MacLane) tells her that when Earle gets there, she needs to lock herself in the bedroom and stay out of sight. She pouts and hears the car indicating Earle's arrival. She dutifully goes to the bedroom, but keeps the door cracked so she can peek, so the man tosses a book at the door to get her to shut it. 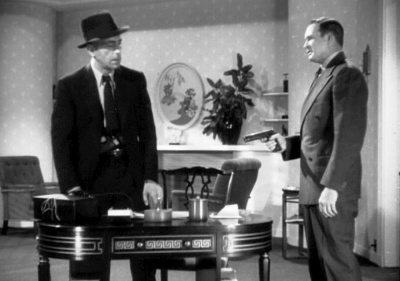 When Roy enters the house, he wants to know where Mac is and the man introduces himself as Jack Kranmer, whom Earle immediately pegs as a cop, though Jack insists he's an ex-cop. Kranmer tells him that Mac is in California and wants Earle to head that way. He's planning a jewelry caper at a ritzy hotel in the resort town of Tropical Springs. Kranmer rubs Roy the wrong way and Earle expresses suspicions about him, wishing to talk to Mac himself. Kranmer reminds him that Mac spent a fortune springing him from prison so Mac "calls the tune and you dance to it." We finally get to see the tough side of Earle as he gives Kranmer several quick slaps on each side of his face before exiting. While on the road to California, after a brief stop for a nostalgic look at his childhood farm (this Earle really is a softie at heart), Roy's driving skills save himself and another vehicle from having an accident when the other car swerves wildly when a rabbit darts across the two-lane-highway. Down the road a bit later, Roy stops for some gas and the lonesome attendant chatters away about the sight of the Sierra range ahead and Mount Whitney, the highest point in the U.S. 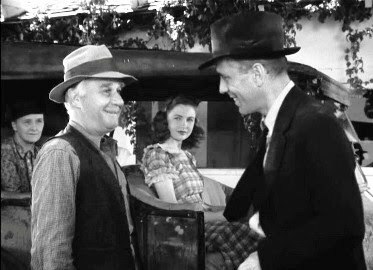 The car that almost collided with Roy happens to pull up and the old man in it (Henry Travers) hops out to extend his gratitude to Roy for saving them from a wreck. He says his granddaughter Velma (Joan Leslie) was driving at the time and she probably had been driving longer than she should have been. He introduces himself and his wife (Elizabeth Risdon). It seems that they have just lost their farm and are heading to California to live with Velma's mom. Roy wishes them luck and departs with a kind smile. Earle rolls into a lakeside lodging camp where his two caper associates are staying. 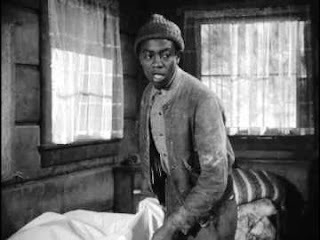 The place is mostly a site for fishermen and the first person he encounters is a black man named Algernon (Willie Best), who unfortunately is played as the worst of comic stereotypes of the era. It's really one of the few blights on an otherwise classic film. Algernon tells Roy two men have been expecting him and points out which cabin Roy's staying in and which cabin holds the two men. Roy also meets a scrappy little dog named Pard. (In the opening credits, they get it wrong and say 'Pard' as 'Zero', though it's fixed for the end credits.) Earle compliments Algernon on Pard, but is corrected. Pard isn't his: His original master got killed in an accident there and Pard just never left. Roy asks Algernon to drive his car to his cabin and take his bags inside and he heads up to meet the men who will be his partners in crime. Before he meets the men, he grimaces, because a woman sits outside the cabin, idly stirring the dirt with a twig. 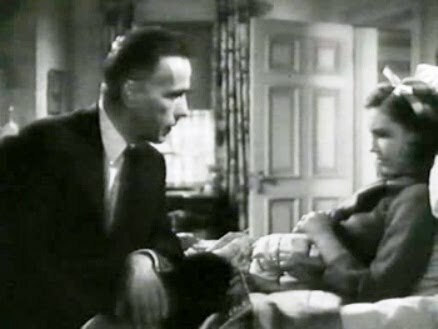 He asks her about the men and first Red appears (a very young Arthur Kennedy), followed by Babe (Alan Curtis). They introduce the woman as Marie (Lupino). Earle asks Red if he can speak to him alone. He learns that Babe picked up Marie and Roy tells him to get rid of her, send her away. A woman will just be a distraction. Red returns and shares the news with Babe and Marie. The two men provide a study in contrasts in their assessments of Earle. Red practices a sort of idol worship as far as Roy is concerned, while Babe thinks Earle looks old and out of touch and doesn't like him giving them orders. Marie adamantly declares that she doesn't want to go. She has no intention of returning to the dime-a-dance joint where she used to work to make a living. She decides that maybe she can change his mind herself, but Red and Babe laugh at her. The next morning, Algernon comes to Roy's cabin with Pard and asks if he can do anything for him. Earle says he can use some breakfast, but Algernon says that Marie already has prepared that for him. He then shows off how smart Pard is by demonstrating some of his tricks. As Roy begins to dine, Pard comes begging. Earle compliments the dog as a born panhandler just as Marie arrives and Algernon excuses himself. Marie eases into the subject, suggesting first that Roy should go outside and get some sun. "Where I was staying, they didn't let me get out in the sun. Afraid I might spoil my girlish complexion," Roy responds. Then Marie brings up the subject of her leaving as gracefully as she can, telling Roy that she hears he wants her to go back to L.A., but she'd prefer to stay. Marie then drops a little bit of information on him. Be wary of Louis Mendoza, she tells him. Mendoza's their inside man at the Tropico hotel, where he's the night manager. Marie tells Roy that Mendoza has a tendency to talk too much. Marie's gambit seems to have worked as Roy tells her she doesn't have to leave immediately. They'll see how things play out first. Later, Mendoza (Cornel Wilde) drops in for cards with the guys. Earle comes by for a visit and interrupts their game, figuring it's a perfect time to go over the heist plans. The shifty Mendoza makes him nervous. They lay out the floor plan for the hotel to start planning the heist. Red, excitedly, bring out a violin case to show Roy what they've acquired: a trusty submachine gun. Roy takes the opportunity to tell a story about a crew with a similar weapon, a crew convinced they had a rat in their ranks. As that crew sat around, their leader held the gun with his finger on the trigger as they made small talk and watched the suspected rat sweat. The more they talked, the more he perspired. The leader's finger slipped and the gun went off three times — which Earle punctuates with three quick loud taps on the table — and the rat was dead. Just like that, Roy repeats, doing the taps again. He'd made his point: Mendoza was thoroughly intimidated and stood, wiped his brow and told them that they should be ready in a couple nights. Earle similarly excuses himself. Even Babe is impressed at Roy's ability to get his message across. While waiting for the night of the heist to come, Roy takes an excursion to Los Angeles to meet with Big Mac. On the way, he encounters a traffic jam caused by a wreck. It turns out that the fender bender — a parked car pulled away from the curb without signaling and dented another vehicle — was caused by the same family he met on the road. The driver they hit raises a ruckus, but Earle smooths things over and slips the guy some cash, despite a witness saying that Velma was driving. When she gets out of their car, the witness yells, "Look! She's a cripple!" For the first time, Earle learns that Velma's problem is a club foot. Roy asks her "Pa" about the foot and he tells him that when she was young a doctor told them she could have it fixed, but nothing came of it. Her grandfather thanks Roy for helping them again and Earle continues his journey to Mac's. When he reunites with Mac (Donald MacBride), he finds that the crime boss isn't well. He's confined to bed, but he's still partaking of plenty of booze, despite doctor's orders. Mac tells Earle how overjoyed he is to see an old pro like him again since he's been forced to work with such screwballs. "All the A-one guys are gone, dead or in Alcatraz," Mac tells Earle. "Times have sure changed." Roy agrees, adding, "Yeah, ain't they? You know, Mac, sometimes I feel like I don't know what it's all about anymore." It's here where High Sierra makes clear what its underlying theme is. This isn't your typical gangster story or even a tale of an aging criminal. High Sierra plays as an elegy for all the gangsters and the type of gangsters movies that made Warner Bros. in the 1930s. There would still be others of course, and some great ones such as White Heat, but, in a way, as war was enveloping Europe and would soon draw in the U.S., High Sierra was composing a sort of requiem for the genre. Mac and Roy hear the arrival of his doctor, so Mac urges Roy to hide the liquor. The doctor turns out to be another old pal, Doc Banton (Henry Hull), who while not a real doctor, has worked with and on Mac and Roy's criminal crews for a long time. Roy's surprised that Doc has moved his operations west as well. "Roy, this is the land of milk and honey for the health racket," Banton says, "Every woman in California thinks she's either too fat or too thin or too something." After giving Mac the once over and again warning Mac to lay off the booze, Roy asks if he can talk to Doc in the other room. He asks what he knows about club foots and the possibility of fixing them. Doc says it depends on how bad it is, but it is certainly possible, but he couldn't do the surgery himself. Roy asks if he could take a look at Velma for him and Doc agrees, though he advises him that it could be expensive. Roy returns to Mac, who immediately motions for him to bring back the liquor. Earle hesitates, mentioning what Doc said, but Mac brushes him off. Mac says Doc may think that if he doesn't stop drinking, it will kill him, but he's going to die, but he's going to die anyway. "We all are, aren't we?" Mac says. On that subject, Mac gives Roy an envelope. Should something happen to him before he can get the booty from the heist, Roy should open this envelope and follow the instructions inside. It's late when he returns to the cabins, and he finds Marie in his, sitting in the dark. He turns on the lamp and sees the large bruise on her face. He asks if Babe did this and she confirms it, saying that he and Red got into a drunken brawl and she took an errant blow. Roy told her not to fret and proceeds to go talk to his associates about how to behave. Earle's demeanor has softened toward Marie, just as it has toward Velma. He's a hard-bitten criminal, but there's are soft spots inside him, not just for the women either, even for the dog Pard. While a heist motors the plot of High Sierra followed by a man hunt, really this isn't your standard suspense outing in the crime genre. It really does have that wistful feeling about it and thanks to Bogart's starmaking turn, it's really more of a character study than other films you'd find in this realm, one where many of the characters have a nihilistic streak, seeing not only the end of their line of work but of their lives as well. Walsh directs it quite beautifully, knowing when to tease with moments that need the suspense, but also ably handling the more tender sides. Of course, Walsh would reinvigorate the genre again in White Heat and before High Sierra he'd helmed They Drive By Night and The Roaring Twenties as well as many classics in other genres including Westerns, musicals and comedies and he'd been working since the silent era, including making one of Gloria Swanson's most famous films, Sadie Thompson. In High Sierra, Walsh fills the frame with some gorgeous shots, thanks to cinematographer Tony Gaudio, who makes excellent use of the natural settings that surround the story. Gaudio's name isn't often mentioned when listing the great d.p. 's of that era but he also worked on some other marvelous looking films such as Michael Curtiz and William Keighley's The Adventures or Robin Hood and William Wyler's The Letter. Having never read the novel High Sierra, I can't say for certain how much of the dialogue was lifted directly from it, but just from hearing so much of his other work, I have to believe that John Huston has to get the credit for the majority of memorable lines that run throughout the course of the entire movie. He got his start as a writer and a script doctor and it was his work on this film, on which he spent a lot of time on the set, that finally gave him a chance to sit in the director's chair. How fortuitous, if only for allowing the bonding that took place between him and Bogart. They became one of the greatest actor-director teams in the history of film, alongside the pairings of Kurosawa and Mifune, Ford and Wayne and Scorsese and De Niro. Before High Sierra, Huston's credited work included Jezebel, Juarez, Dr. Ehrlich's Magic Bullet and Sergeant York. 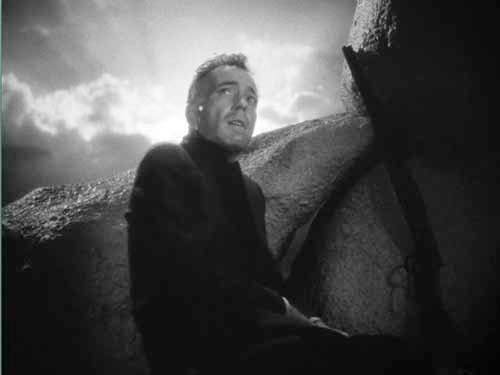 He also did uncredited work on Wuthering Heights and, years later, on Orson Welles' The Stranger. Huston was a very talented man — and he could act too. By this point in the movie, all the pieces and characters are in place for the various story strands that will lead to Roy Earle's undoing, emotionally and physically. It may seem an odd comparison, but when I wrote on one of my favorite films, Broadcast News, I titled the post "An unrequited love triangle" and that's really what you have set up in High Sierra. For all Roy's initial warnings to Red that having a dame around while planning a caper would be a distraction, that's exactly the trap that Earle falls into with Velma. He's not just playing good Samaritan in his plan to fix her foot. Despite the huge gap in their ages, he pictures her as his bride once the job is done. Pa thinks Roy would be good for her, though he warns him that she's stuck on a fella back where they used to live. "It seems to me I've been close to Velma for a million years," Roy tells him while Doc is in the other room examining the feasibility of an operation. Everyone is overjoyed when he says that he's seen much worse and he's talked to the best surgeon in L.A. and thinks it can be done. Velma displays much gratitude to Roy, but it's obvious she doesn't share the romantic feelings the older crook has developed. As Doc and Roy drive away, Doc tries to talk sense to Earle, asking him what he thinks is going to happen once Velma and the rest of her family learn what he really does for a living. He tells him that she's not the type of girl for him. He needs someone who can run as fast as he can. "Remember what Johnny Dillinger said about guys like you," Doc tells him. "Said you were just rushing toward death." Again, by citing the real-life dead gangster the film keeps its theme alive of the dying of a lifestyle. Now to have a triangle, you need three points, even if it's an unrequited one, and that third point is Marie. When we met her, we were given the impression that she was Babe's gal, but the film never shows any indication of warmth or affection between the two of them. We also assume that as she warms up to Roy it's more a matter of her wanting to avoid a return to her less than savory lifestyle at the dime-a-dance joint, but as the film develops, you see she's developing a true attachment to him. Part of it is that she recognizes that softer side that he usually hides from his criminal cronies as when they discuss what kept him going in prison and how he would never go back behind bars again. At another point, Marie happens to catch Roy having terrible nightmares while he sleeps. Roy, who was eager to get her out of the lodging camp for fear of complications, comes to accept her presence, but not for romance or because she's pleasing to the eye, but because he suspects she might be a useful part of the heist crew — and probably more competent than either Red or Babe. When he decides to check out the Tropico himself, he takes Marie along. Unexpectedly, he takes a third member: Pard. The mutt also has grown attached to them, having already lost his previous master, so when he hears Roy's car leaving, Pard furiously chases it, until Roy stops the car and lets the dog hop in and ride in Marie's lap. When the night of the actual heist actually arrives, they pay Algernon to lock Pard up, but the resourceful pup manages to open the cabin window and get out and chase the car again that night. Roy grumbles then that he probably should have shot the dog, though we know he doesn't mean it, and then adds, "Of all the 14 karat saps — starting out on a caper with a woman and a dog." After Roy spends $400 for the surgery to fix Velma's foot (and it's deemed a success), he goes to visit her while she's still recuperating in bed. He's ecstatic and feels it's time to lay his heart out to her and proposes marriage. The question takes the happy Velma aback. She's grateful for all Roy's done to help her, but she tells him that there's someone else back home and now that her foot is fixed, nothing should stand in the way of her marrying Lon. Bogart's demeanor will break your heart. He plays Roy as being stoic as he can at the news, but you can see that he's been shattered. Nothing really matters to him at this point but the job and if it ends badly for him, so be it. 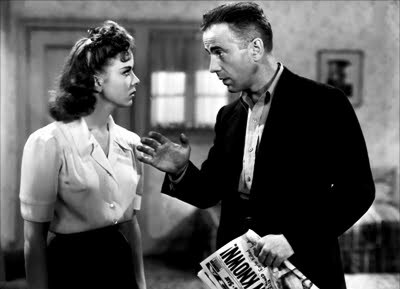 He never says it in words, but the realization that he was stupid to think a man his age (the movie never pins that down, but he's obviously supposed to be older than Bogart's 40 years) could win the heart of a cute young 20-year-old, or was he merely trying to buy it by fixing her foot for her? He makes a hasty exit, though he promises Pa that he'll come back and see her again when she's up and walking, though you know he doesn't want to see her ever again. 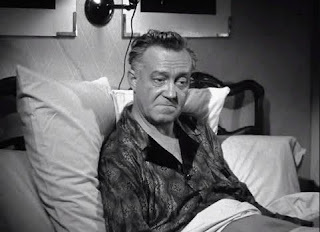 After he leaves, Pa sits at Velma's bedside. She's upset because she didn't want to hurt Roy after all he's done for her, but, "I'm not crippled anymore Pa and I'm gonna have fun." Her few tears are gone as Velma dreams of dancing with Lon and tells her grandfather she doesn't love Roy and she never could. Her grandfather doesn't say anything, but you can tell he's disappointed in her and sees in her a bit of her trashy, good time gal mother, who we saw briefly in an earlier scene, who annoys her father to no end. After what seems like an eternity of waiting, the time finally comes for the night of the heist. Roy goes over the plans once more with Red, Babe and Marie (Pard doesn't get specific instructions, since they don't know he'll be tagging along at this point). 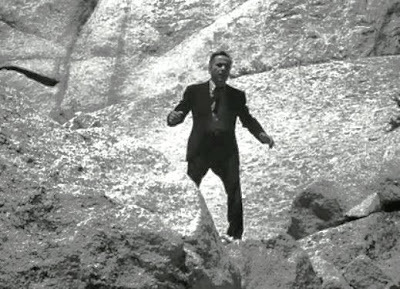 As is the usual staple in most movies of this sort, the caper does not go smoothly. Roy will keep the lobby employees at bay (including Mendoza) while Red and Babe break into the security deposit boxes for the jewelry. Marie will sit outside in Roy's car and honk if she sees anyone approaching. It seems to be going OK, with only a waiter to worry about, when a rich couple arrives. Marie gives the signal and Earle herds the pair and the waiter into the sitting area to watch over. Marie has to honk again though when a security guard making his rounds gets suspicious and comes in. Roy gets him to drop his weapon at first, but something startles the woman who screams and Roy ends up killing the guard. Red and Babe return with the booty and the nervous wreck Mendoza insist that he come with them because he didn't realize anyone would get hurt and he knows he'd break. Mendoza joins Red and Babe in their car, Marie, Roy and Pard head off in his. For some reason, Red heads off on the wrong exit and Roy follows them only to see the other car spin out of control, turn over and burst into flames. Roy knows that the wreck means trouble, even if all three perished, so he figures he better head straight to Los Angeles to give the jewelry to Mac, get his cut and hightail it out of town. When he gets to Mac's, he's not happy to see Kranmer greet him at the door. The news of the heist is all over the news and Kranmer informs him that Red and Babe are both dead but that Mendoza only suffered a broken collarbone. Earle suggests that they show Mac the goods so he can get out of there. Kranmer says Mac had been sleeping, but he'd want to wake up for this. When they enter the bedroom, they realize Mac's not sleeping — he's dead. Kranmer sees it as an opportunity for the two of them to split the bounty themselves, but Roy tells him that Mac anticipated this might happen and left him instructions. He opens the envelope and then calls the name inside and tells the person what happened to Mac. 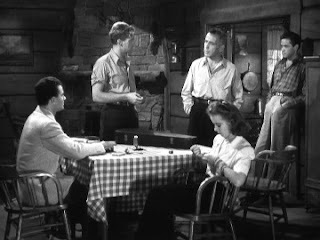 He's preparing to leave, when Kranham pulls a gun and says that he'll be taking the jewels and taking care of Earle as well. He thinks he might get a reward, maybe even reinstatement to the police force. "Like I told Mac," Roy says, "a copper's always a copper." Earle then tosses the box at Kranham, pulls his piece and kills him, but not before Kranham gets a shot off as well, wounding Roy. He grimaces his way to the car with the box and tells Marie she'll have to drive and tells her to take him to Doc's. Doc says the wound barely missed his heart, but he'll need to take it easy. Roy apologizes that he doesn't have anything to pay him right now, but he's going to get it soon. When he gets back in the car, he tells Marie he has to keep a promise as long as he's in L.A. and he goes to Velma's house. He finds Pa at wit's end because Velma and Lon (John Eldredge) are drinking and dancing with two of Lon's friends. Roy's visit delights Pa, but Velma seems particularly annoyed. Hurting from his wound (both the physical and mental one) and seeing what type of person Lon is, Roy actually asks Velma if Lon is the type of person she wants to spend her life with as says he could give her so much more. He's unaware that Marie has entered the house just as Velma lashes out at Roy and says she could never love someone like him, telling him he's old and practically calling him ugly. Earle has a few choice words for Lon and then rushes out. Pa tells Marie that he hates what just happened because Roy has been so good to them, but Marie says maybe he needed to see and hear it for the truth to finally sink in. Once Roy and Marie are safely out of earshot, Lon says he should have punched him for the way he acted. High Sierra really takes an interesting twist on the usual female roles in the crime pictures. Velma, who seems to be the "good girl," turns out to be the heartless one while Marie, set up as the hardened gangster moll, really has the big heart full of love and caring. Roy has Marie drive him to the man on the phone to collect his cut and get the hell out of town. Unfortunately, the man tells him it will take a few days for him to unload the jewelry and give him the full cut. Earle tells him he better not be trying to pull something on him. The man assures him he's not and gives him two options: he can keep the jewelry until the money comes in and risk being caught with it or he can advance him a couple hundred bucks now and wait for the full payment. Earle opts for the cash and leaves the jewelry, though he does take a ring. When he returns to the car, he slides the ring on to Marie's finger. He says it's a gift. She says it's the wrong finger, but she welcomes it anyway. They then head off to find a hotel to hole up in until Roy can get his full $40,000. While there, Marie notices that his wound still is bleeding and she tries to patch it up the best she can. Later, when he goes outside the room to grab a paper, a stranger mentions something that Roy realizes he's been made. He takes the man inside the room at gunpoint. After knocking the man out and locking him in the closet, he opens the paper and sees his picture with his hated nickname "Mad Dog." He realizes that Mendoza has been talking and regrets not killing him when he followed them out of the hotel. He tells Marie to go the store and get a basket that she can carry Pard in and a suitcase for him. They are going to have to separate. Marie doesn't want to leave him, but he reminds her that he told her that at some point he might have to park her somewhere for her own safety. "Brother, when they hang that No. 1 tag on you, they shoot first and argue afterwards," he tells her. He gives her the money he got and tells her to get on a bus to Las Vegas and he'll try to get there when the heat is off. She protests, but eventually agrees and gets on the bus. Roy, strapped for cash, stops at a drugstore and holds it up for some cash, but is identified. 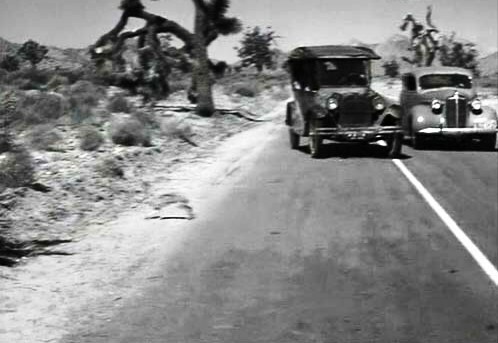 It leads to a chase that takes him to a dead end and forces him to climb the Sierras for refuge. On the bus, Marie hears a radio account of what has happened and asks the driver if there are any buses going the other way and she heads back west to try to help Roy. 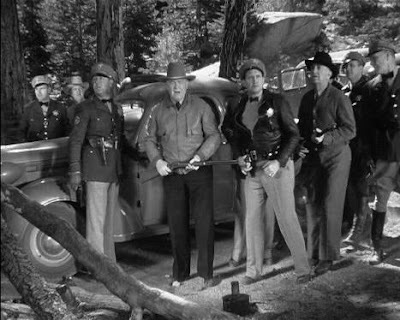 The authorities set up camp at the bottom of the mountain and try to communicate with Earle to no avail. They also work at trying to get a sniper into place above him, but are having difficulty in that respect as well. Roy just stays in the rocks, day and night, with his gun. Eventually, they are able to move a marksman into place above him, but not to where he can get a good shot. The standoff begins to weigh on Earle. He knows he's reached the end of the line and that he's not getting out of this one. As he's starting to face his own mortality, Marie has joined the gathered crowd at the mountain base. She tries to cross the police line and gets pushed back until one of the lawmen notices her basket and asks if she might happen to have a dog in there. He identifies her as the woman with the dog that had been witnessed on the run with Earle and he brings her forward and tries to get her to talk to him, but every time she starts to, she stops, fearing she's being used just to bring about his death. Unaware that Marie is even there, Roy begins writing a note. It says that he knows that he's not going to make it out of this, but when they find this note on him, he wants the authorities to know that Marie had nothing to do with his criminal activities. At that moment, Pard pops his head out of the basket and barks. Earle recognizes the voice and stands up, the note being blown to the wind at the same time, calling, "Marie." That's all the marksman needs and he squeezes off the fatal shot that brings about the end of Roy Earle, who tumbles down the mountain. When he lands, Pards runs to him, licking his hand and his face. Another master has been lost. 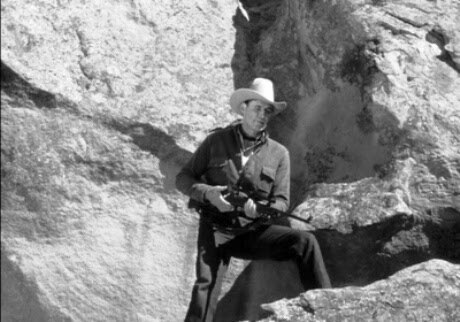 The authorities lead Marie off in tears and Walsh ends the film as he began it, with credits scrolling up over the mountain range. 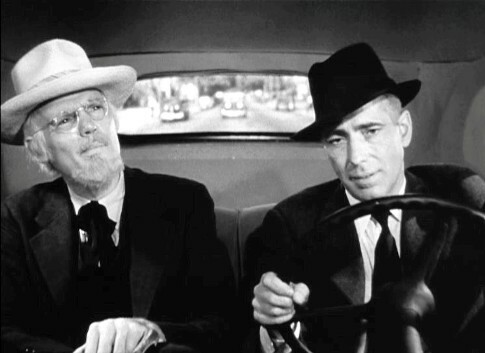 Roy Earle's career as a criminal had come to an end, but Humphrey Bogart's career as a superstar had just been born. As Bosley Crowther wrote in his 1941 New York Times review of High Sierra: "Mr. Bogart plays the leading role with a perfection of hard-boiled vitality." Earle was just the beginning. 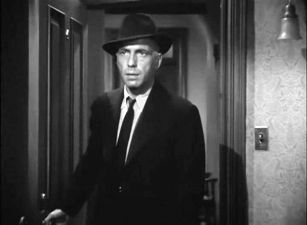 A few months later, he'd bring us Sam Spade in The Maltese Falcon and in November of the following year, Rick Blaine in Casablanca. 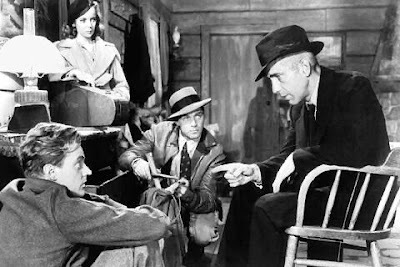 It's not just that they don't make movies like High Sierra anymore, it's that we don't get actors/stars like Bogie anymore either.